Kayaker Pat Keller’s passion for watersports began at the age of 3. Photo courtesy of Sarah Ruhlen. Skiing, snowboarding and climbing are all well-known mountain sports popular for producing rushes of adrenaline and excitement. For 30-year-old Pat Keller the beloved adrenaline rush and excitement comes from a different local mountain sport. Even Keller’s dog Ashlu is influenced by the kayaking world. Keller said he began participating in watersports at 3 years old when he went out in a canoe with his dad. Keller said he began competing first in slalom racing, or competing with the aim to navigate through a course of upstream or downstream gates on a river in the fastest time possible, but he was not too stoked on it because of all the paddling. He started competing between the ages of 8 and 9, but he had not been completely motivated to pursue kayaking as a sport just yet. His mind was in a different world as far as watersports were concerned. It was not until he went down his first waterfall that kayaking grew into something more than a hobby. Keller races down the Green River. Photo courtesy of Sarah Ruhlen. At age 14, Keller said he went to Adventure Quest, a traveling kayaking school based in Vermont. Kayaking itself is typically done for recreation to sight see, fish or get exercise, while whitewater kayaking, as a sport and for competition, is a completely different beast. Kayakers must be able to read the river, watch for dangerous objects in the whitewater and navigate all while using all of their energy to go as fast as they can, as cleanly and safely as they can. 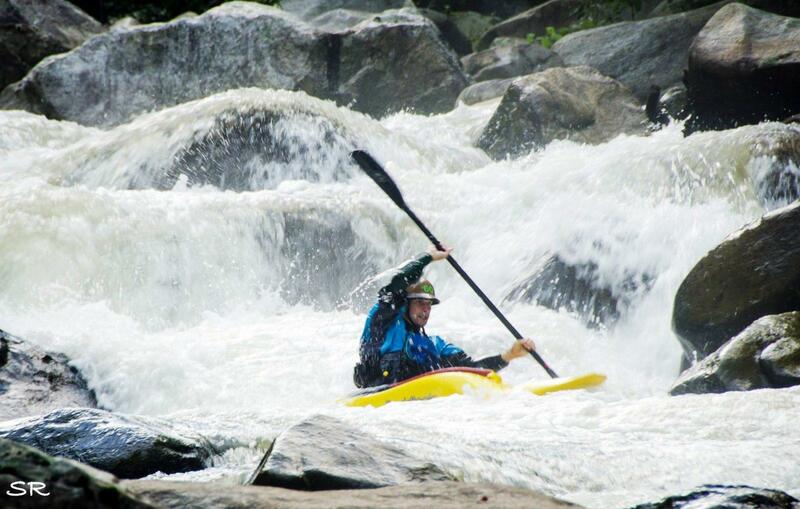 Kayakers must be able to react even when things are going wrong. Keller said the more comfortable you are, the better. Keller competes in kayaking competitions to this day and the Asheville native said his favorite one is, of course, the race closest to home. “My first Green Race was in 2001, I was using a short boat at the time, but now I stick to long boats typically for the speed boost,” Keller said. The Green Race has been held annually on the first weekend in November since 1996 on the Green River Narrows, drawing in kayakers from all around the world. Keller said he raced the Green every year except for two since his first in 2001, due to injuries. He has been in the top five of the longboat class every year except for one since he started. “It’s my home turf, so the crowd is good and all my friends are there which just adds to the already good energy from the area,” Keller said. The kayaker lives for learning new things and putting them into execution. This is why he continues participating in the kayak community in more ways than one. Keller started his career working for Dagger Kayaks and he now works as a boat designer at Liquidlogic. Keller said his current boss Shane Benedict is actually his old coach and teacher from his time at Adventure Quest. “I took his boat building class and from then on I was hooked,” Keller said. Keller said he admires kayakers like Mike Dawson for his speed on the water and Andrew Holcombe for giving back to the kayaking community by teaching kids both skills and a passion for the sport. Cool! How come you are so brave? what’s kind of sport is it? ?